Imagine if we were all an ingredient; wouldn’t reaching our potential be so much easier?? 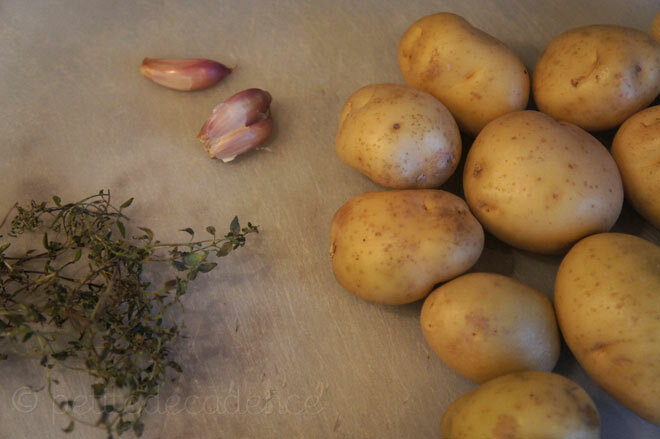 I guess it would depend on which chef’s hands you found yourself in though… But all modesty apart, I think I helped these slightly old potatoes sitting in my vegetable drawer along their way to stardom. And I know, nothing, absolutely nothing, beats some good old gratin dauphinois, especially my mother’s on christmas eve, (because there really is nothing in the world that can compare to cream, cheese and soft warm potatoes all together next to a tender slice of turkey) but this kind of baked potatoes, which are originally known as hasselback potatoes and are of swedish origin, are really high up there in the ladder of potatoes reaching for the stars. 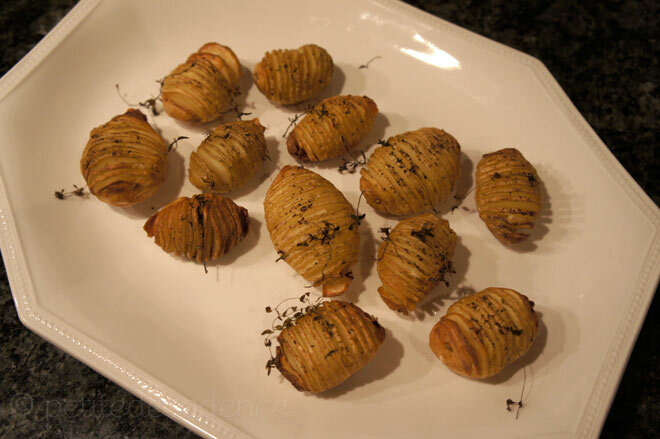 And that’s not only because they’re insanely delicious, crispy on the outside and soft on the inside, but because they’re also healthy (as far as healthy and potatoes can go together) and quick to make. The original version has breadcrumbs, tons of butter, and if I’m not mistaken, paprika. 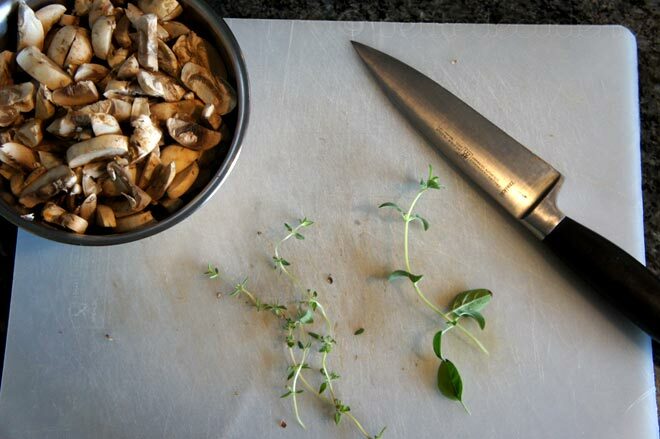 This version, however, is far simpler; thyme, teeny tiny bits of butter and garlic. That’s all you need. Really. Oh, and a sharp knife. Mmm yeah, so I haven’t posted anything in a long time. I have good reason, but I won’t get into it here. Let it be enough to say that the past two weeks have been the worst of my life, and not even my kitchen has convinced me that the show must go on. And I know the show must go on. It’s just bloody difficult. 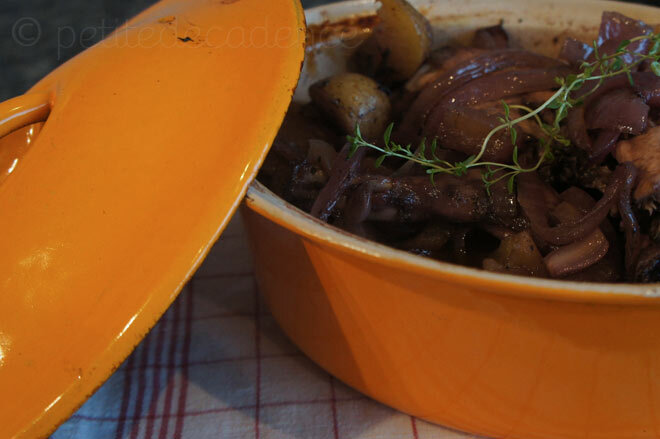 Anyway, the following is a recipe with a lot of meaning to me – because it’s rabbit. But I won’t get into the melancholic details. One thing worth mentioning though, I made this about 10 days ago, on the day this very horrible streak of bad things began happening, but always with a silver lining; I came home (all puffy-eyed and exhausted from crying) with two very meaningful rabbits in my hand. My mom found me, and since she is such a wonderful mom, abstained from asking any questions and instead proceeded to have a cooking fiesta with me; we each took a rabbit, to be cooked in different ways. Now, this doesn’t sound like such a shiny silver lining, but my mom and me in the kitchen at the same time??? Never heard of before. We’re usually in each others way and always en up fighting because I have no tolerance to her every-two-minute remarks of how I should modify whatever it is I am cooking. But this rabbit is different, because it was a lot more about her being there for me, without questions, without trying to change me, (or my recipe!) and just keeping me company in a moment where probably nothing else could have saved me. After the rabbits, we also made salsa, and two apple cakes. And believe it or not, that day, a whole day in the kitchen, even being exhausted, was just what the doctor had prescribed. This recipe is really easy, and it’ll take you no time to make (That is, if you’re not butchering your rabbit yourself, as I did). It does take long to bake though, so keep that in mind. It’s absolutely worth it though, the apples and potatoes melt in your mouth after having been in there with rabbit for almost two hours. Recipe after the jump. So today started as pretty rough day, even though the first thing I saw when I opened my eyes was raindrops, the wet bark on the trees outside my window, and a lot of birds. (My favorite sight to wake up to). I slept virtually nothing and had an appointment with my acupuncturist, aka my torturer. Anyhow, after muscle therapy, a nerve block, needles and laser therapy, I left nauseous, dizzy and barely able to stand up, with an apple in my hand kindly provided by one of the assistants. Once back home, I crashed on the floor in my room and dozed for about two hours, and then came back to consciousness with one thought in my mind; I need a pick me up. And so, seeing the pouring rain outside my window, got a strike of inspiration, and a chance at feeling better. 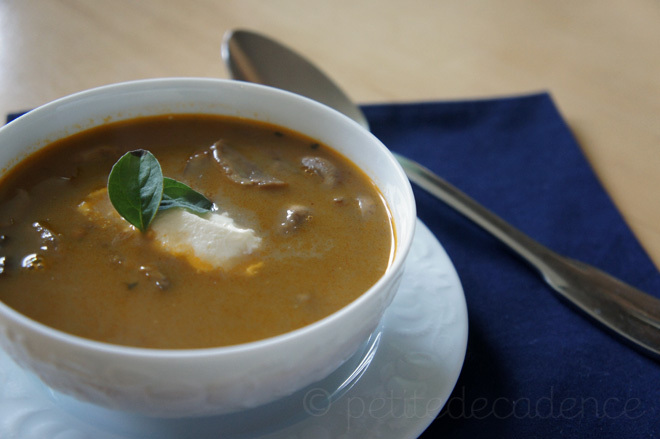 This soup, due to the lack of vegetables in my fridge, has an onion base with a lot of broth, but its compensated by the delicious buttery and milky mushrooms you’ll add at the end. The result is very light, creamy, delicious smelling lentil goodness. Heat the olive oil in a large and deep saucepan. Add the chopped scallions and red onions, along with the whole stems from the scallions (you’ll be taking these out later). Cook over med-low for about 5 minutes, until the onions are soft and see through. 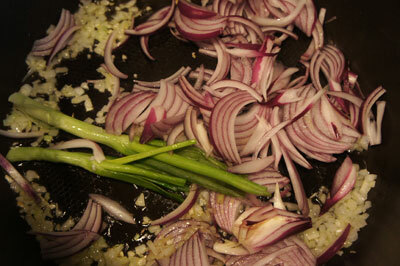 Add the shallot and cook for another three minutes, stirring to keep them from burning. Add the tomatoes, stir and add the broth. 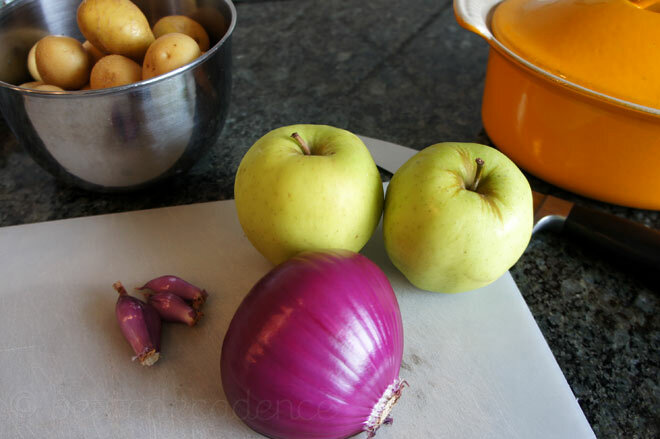 Bring to a full boil and then reduce the heat to med-low. Let cook for 10 minutes, remove the scallion stems, and using the blender, puree all the solids. Return to the saucepan and once its boiling again, add the lentils. Reduce the heat to simmer, cover, and cook for about 35 minutes, until the lentils become soft. Meanwhile, in a separate frying pan, heat the butter until it begins to bubble. 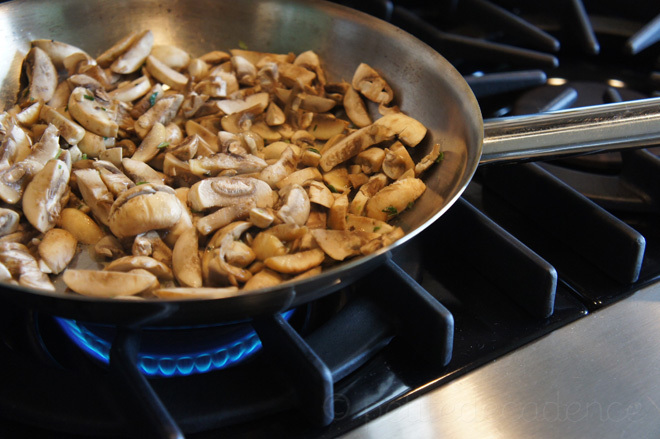 Add the mushrooms (make sure they are dry if you washed them) and thyme. Cook until browned and the butter smells like heaven. Add the half cup of milk, and stir until you get a first boil. Remove from heat and set aside, or if your lentils are ready, incorporate. Turn off heat. Serve with a spoonful of heavy cream and a pair of oregano leaves.